Potential energy is energy that is not "in use" and available to do work. The chemical energy in fossil fuels is potential energy until it is released. Kinetic energy is energy that is "in use" -- the energy a moving object has due to its motion. For example, moving water and wind have kinetic energy. 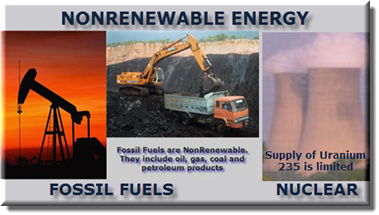 Fossil Fuels - Solar energy from the ancient past is stored in fossil fuels, such as coal, petroleum, and natural gas. Fossil fuels are rich in the elements carbon and hydrogen. These sources of energy take very long periods of time to form and once depleted, are essentially nonrenewable. 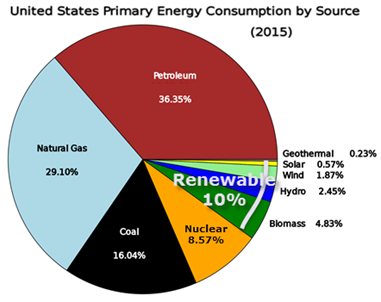 Nuclear power is also a source of nonrenewable energy (uranium is a limited resource). Many of Earth’s energy resources are available on a perpetual basis. 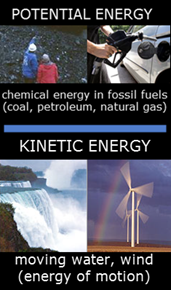 These include solar, wind, water (hydropower, tidal and waves), biofuels and geothermal energy. Some energy sources can be replenished over relatively short periods of time. These include wood and other biomass. Secondary sources of energy, such as electricity, are used to store, move, and deliver energy easily in usable form.